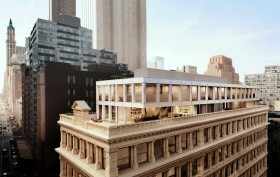 Few intersections of New York come close to perfection, but the corner of Shigeru Ban’s latest New York endeavor at Franklin and Broadway sure comes close. Long anchored by the exquisite 134-year-old James White Building at 361 Broadway, one would assume that a modern penthouse addition could only diminish the neo-Grecian beauty. Not so here. A rehabilitation, conversion, and enlargement spearheaded by Knightsbridge Properties seeks to produce an end sum that will at least be neutral and surely harmonious. Named Cast Iron House by Ban himself, the 13-unit condominium development is a marriage of old, new and timeless, and it reminds us of the incredible sophistication and beauty our city can possess when the bottom line fades. As a sequel to his Metal Shutter Houses in West Chelsea, Ban and design partner Dean Maltz carve eleven airy residences within the sumptuously detailed and impeccably restored 1882 Tribeca cast iron building and float a pair of glass and steel penthouses above.